...it's Tangerine. * That has been the predominant colour in the jewel of the north on this glorious 9th March, dubbed 'Homecoming Saturday' for thousands of Blackpool fans who have been boycotting games for over four years in protest against the Oyston family's poor custodianship and 'illegitimate stripping' of our football club. The day on which the fans finally reclaimed their club and the club got its fans back will go down as another famous date in the annals of Blackpool FC. If anyone ever doubted that the Oyston dynasty would eventually be toppled, last Sunday's Observer put it quite succinctly: "And now, after perhaps the most brilliantly orchestrated and devoted fan protest there has been in English football, his time is up." Finally, the odious ones are gone, removed from the board of the club earlier this month by a court-appointed receiver, and what a celebration we have enjoyed this afternoon, another magical day in the sun for 16,000 emotional Blackpool fans decked in tangerine who congregated opposite the tower and then marched in exuberant, carnival-style procession, banners, flags and scarves waving, all the way along the promenade and back into Bloomfield Road. After a long campaign, waged on several fronts, this was a joyous return, one which many fans thought they might never see. As I wrote in yesterday's Blackpool Supporters' Trust column in the local Gazette: "... to the many thousands who over four seasons took a principled stand against seemingly unprincipled owners, thank you for your unwavering support in helping to bring this change about - and welcome home!" If the parade was exhilarating, with jelly and ice-cream on sale outside the ground as fans arrived, the atmosphere inside a packed stadium was simply electrifying, spine-tingling; the game itself almost secondary to the spectacle unfolding in the stands and the wall of noise that was Bloomfield Road rocking in cathartic release. To be honest, the players were probably a bit fazed - they've been used to performing in a three-quarters empty ground - but they gave it their all and came away with a 2-2 draw against a workmanlike Southend team. Some of you know I moved up to Blackpool in mid-2013 on taking early retirement, to save the 450-mile commute to Bloomfield Road every other Saturday (and some week nights too). It's ironic then that having bought a house within walking distance of the stadium, I've been boycotting it for the best part of five years. Today has felt like a double home-coming and a new beginning. 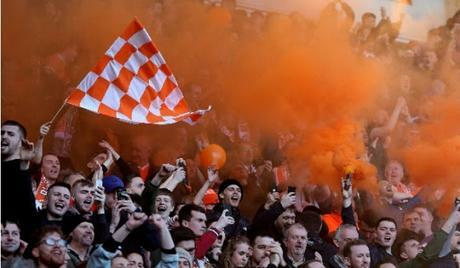 When Blackpool got promoted to the Premier League back in 2010, there was a huge opportunity for the owners of the football club to do something quite remarkable for the club and the town with all the multi-millions that came pouring in over two or three seasons. A well-run and buzzing community club could have been the springboard to rejuvenating one of the most deprived areas in the country - but it didn't happen. We saw that legacy squandered, as the owners chose to milk their cash cow and live off the cream, siphoning off football club money, suing fans who dared to accuse them of improper practices, triggering a massive downturn in the local economy as the team plummeted down the divisions due to under-investment and the fans stayed away in their thousands (home and visiting supporters alike). I hope that as from today that has all changed. 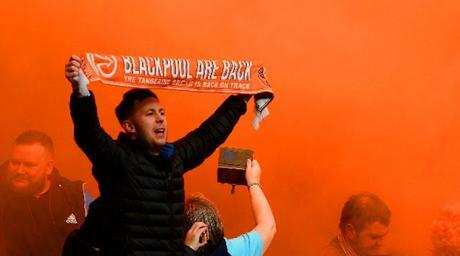 BST's Blackpool Are Back scarves that people have been wearing over the last few days have the sub-text 'The tangerine dream is back on track.' Now that we've surely got rid of the Oystons, and once new owners are in place, we will have a chance to go again at making the football club the beating heart of the community and an energising force for good in the town. It's what a football club should be and the associated feel good factor is something that Blackpool could well do with. The future is tangerine. for fun in the sun. and you'll find a richer truth. much like the painted face of a clown. and their life is hard. for their mighty tangerine passion. This is Blackpool, jewel of the north.